This offer is valid for a limited period of time. Qualifying amount applies to merchandise only, not value of gift cards purchased, packaging, applicable taxes or shipping & handling charges. Offer cannot be combined with any other offers or discounts except GapCard extra 10% Off Everyday offer, initial discount when approved for a new GapCard, and Rewards. Proper for select men's and women's styles for a limited time. The discount is valid on spring dresses. Exclusions apply. The discount is already applied. All sales are final. Enjoy savings on your first purchase when you open and shop a GapCard. The offer is valid while supplies last. As a thank you for signing up for emails, take 25% off reg. price styles online. Plus, the shop is giving you access to exclusive offers, new arrivals, and more. The offer is applicable to standard US wide ground shipping. Exclusive outfit styles for men, women, and kids is what GAP offers. Modern clothes for any ages are made for you with love. And, it's easy to show your appreciation for your lovely person with GAP Gift Card. Cards can be traditional or electronic. You can buy it at any GAP store or online at gap.com. Choose your card in any amount from $25 to $250 and select an unusual design you want. Redeem Gift Cards online or at any factory store and outlet. You can't use your card with store's promotions or discounts. It is simple to check out the balance on your card, just enter the number of your gift card in the special field at gap.com. Buy GAP Gift Card and give something special to your special someone. The Special Offer is expired. Valid for sitewide. Limited time only. Valid for sitewide without minimum spent. Offer not valid online on the following Gap merchandise unless ending in .97 or .99: Jeans, Baby Organics Collection, GapBody Women's Underwear, Cashmere, Sarah Jessica Parker Collection, Leather and/or Suede Apparel and Accessories, GQ, Tretorn, Tzumi, Manduka, Tavi Noir, Soma. The discount may not be combined with other deals. Qualifying amount applies to merchandise only, not the value of gift cards, packaging, applicable taxes or shipping & handling charges. Do you want to renew your wardrobe in your favorite brand online store? Enjoy an extra discount on your picks. Start by clicking on “Show Coupon Code” button. Then copy the code from the next window by clicking “Copy” link. Let's go and pick some styles now. 2. Select fashion styles category from the top menu. 3. Pick among available deals. 4. Click on the image of the item that caught your eye. 5. Select color, size or other options if required for this item. 6. Press “Add to bag” button. 7. Find “Checkout” button at the top right corner of the page when you hoover a bag sign. Fill in all the customer and shipping info and move to “Payment & Promotion” part. Here you can see an empty field with the title “Promo or Rewards code ”. Enter the copied before code into this field and click “Apply” button. 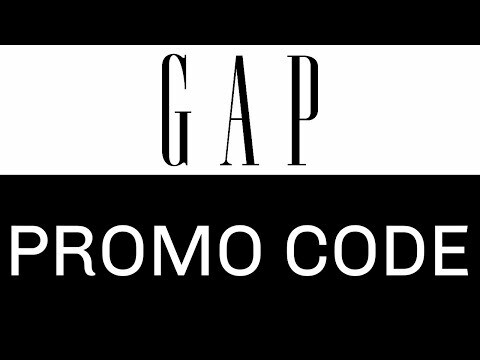 GAP is an American #1 specialty store offering outfit styles for women, men and kids. Looking through the largest selection of accessible fashions, you will definitely find everything you wish. Shop fit and flare dresses for her, casual jackets and jeans for him, fun and colorful outerwear for girls and boys, newborn essentials for babys, comfortable clothes for every trimester of maternity, and a great choice of sportswear for your workout. Moreover, find a vast range the latest styles at affordable prices at gapfactory, enjoy free shipping and easy returns, great discount and a lot more. Visit GAP today and take American style with you. Enter e-mail Enter the password Retype password Enter the shop Enter the code Enter the code description Your account's functions are temporarily limited Wrong answer Enter your name Enter the name or nickname Enter the phone number You are not familiar with the rules Enter a link to this page Enter the review text Leave your comment Enter your current password Leave your message You have already voted for this code You have already rated this article Wrong e-mail Passwords do not match Wrong numbers The field of protection against spam filled incorrectly Review should contain at least 300 characters, and you have This field is required Add your store Verify copied Copy the code Add Select the newsletter Leave a comment Reviews The email to confirm your subscription to our newsletter was sent Describe the problem Use another email address, please. This email domain is blocked.